Growing wheatgrass in the right temperature range and in airy conditions usually prevents mold. Home-grown wheatgrass is the young shoots of plants, usually wheat plants (Triticum spp.) which are grown to make juice. These annual plants can look moldy when they sprout, and they can also develop mold on their seeds, roots and shoots. Wheatgrass seeds that are sprouting develop tiny white hairs that can look like mold. A spiderweb of fine white threads covering the seeds in a wheatgrass sprouting tray probably isn't mold -- these are the root hairs and are a sign your wheatgrass is seeking out water. Place a plastic cover or bag over the seed tray to maintain the moisture levels, and water the tray once a day in the morning. Pour water slowly over the surface until it appears through the drainage holes, and allow the tray to drain thoroughly before replacing the cover or bag. When the wheatgrass shoots sprout, place the tray in a bright spot, but out of direct sunlight. A blue-green or brown mold sometimes develops on wheatgrass seeds, but there's no need to prevent this. Blue-green or greenish mold often appears on wheatgrass seeds that have sprouted, and unsprouted seeds can develop brown mold. These molds only affect wheatgrass seeds, which you don't eat. When harvesting wheatgrass, cut the shoots above the seeds to avoid the moldy areas. Sterilize your scissors or pruning shear blades by wiping them with a cloth dipped in rubbing alcohol before and after harvesting wheatgrass. You can help protect wheatgrass roots from brown mold by sterilizing seed trays. Brown mold often develops on wheatgrass in higher temperatures but the mold doesn't usually affect the plants. Brown spots on the root system are the first signs. Sometimes the mold grows strongly and damages wheatgrass roots. In severe cases, it progresses up the shoots and the plants die. Wash wheatgrass shoots after harvest if the plants have been mildly affected by brown mold, and put severely damaged shoots in the trash. To help prevent problems with brown mold on wheatgrass roots, sterilize the seed trays before sowing wheatgrass seeds. Dilute a product containing 3 percent hydrogen peroxide at a rate of 2 1/2 teaspoons in each 1 gallon of water, and soak the seed trays in the solution for 30 minutes. Good air circulation and moderate temperatures help prevent cottonlike mold on wheatgrass shoots. An airborne mold, the white cottony threads that grow over wheatgrass shoots develop in still, humid, warm conditions. Sow wheatgrass seeds thinly, so the seeds don't touch in the tray, and place the trays in an airy spot, such as near an open window, a fan or an air conditioning unit. 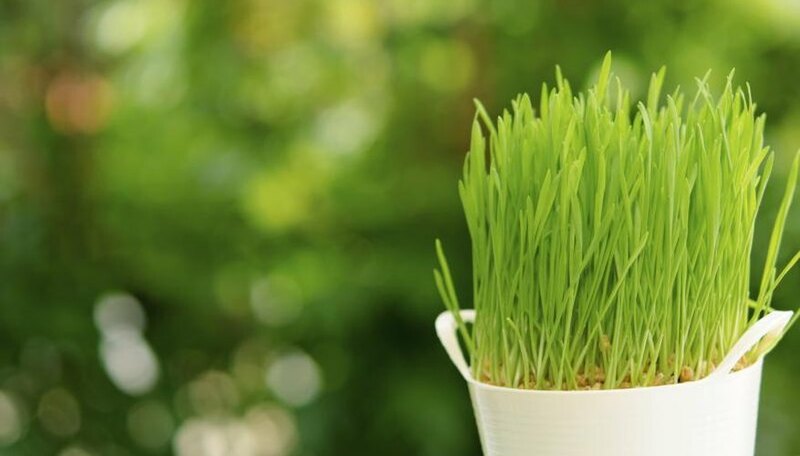 Grow wheatgrass when temperatures are between 60 and 80 degrees Fahrenheit, or adjust temperatures to this range with a heater or air conditioning. If problems with mold continue, experiment with different types of wheatgrass seed.